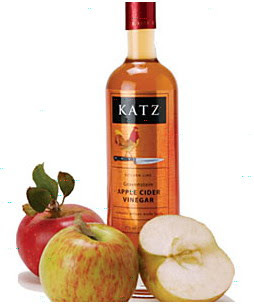 Apple cider vinegar is made from apple cider fermentation. Through the fermentation, sugar contents on the apple cider is ruined by bacteria and yeast into alcohol and then into vinegar. Apple cider vinegar contains of acetic acid (like other types of vinegar) and some lactic, citric and malic acids. Apple cider vinegar can be used to make your hair glow and healthier. Just mix ½ teaspoon of apple cider vinegar with a cup of cold water. Use this mix to rinse your hair. Apple cider vinegar can be used to control the pH balance on your face. Clean your face as normal then use the apple cider vinegar as toner. Do it regularly at morning and night. If you feel stiff on your hands and feet, use apple cider vinegar to massage them. Mix 2 tablespoon of apple cider vinegar with 1 cup of water and little bit honey (for added the sweet taste if you like). Drink it 3 times a day. Remember to rinse out your mouth after drink this health tonic to remove any leftover acid on your mouth. Apple cider vinegar has the acid characteristic, so it’s better to test your skin first before use it. Place a drop of apple cider vinegar on your chin and wait for 15 minutes. If there is no reaction at all, probably you don’t have any allergic to it. But if you find it too strong, you can mix it with water.